This handy tool fits perfectly into the palm of your hand and lets you guide and manipulate your fabrics under your iron or sewing machine without getting burned or hurt. Use it to hold your templates and fabrics when preparing your applique pieces. It is also great for scoring and removing papers from foundation piecing. 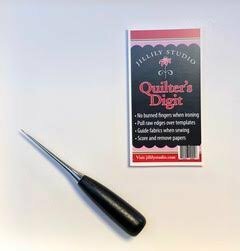 The Quilter’s Digit is a necessary tool for every sewist!